The heat wave is upon us. The whole of next week is forecast to be above 100°. Life suddenly becomes an indoor affair; I have friends who do not venture out for all of July and August; I have some who remain behind closed doors for as long as June-September. I can tell they’re retired. I do know that this year summer crept up and pounced. There was no spring to gentle the advance of the scorches of 90° days. Quite astoundingly it went from rainy and cool to a furnace and I hadn’t had a chance to ease myself out of my sweaters and jeans and into my flip flops and shorts before I was gasping for breath in the humidity. 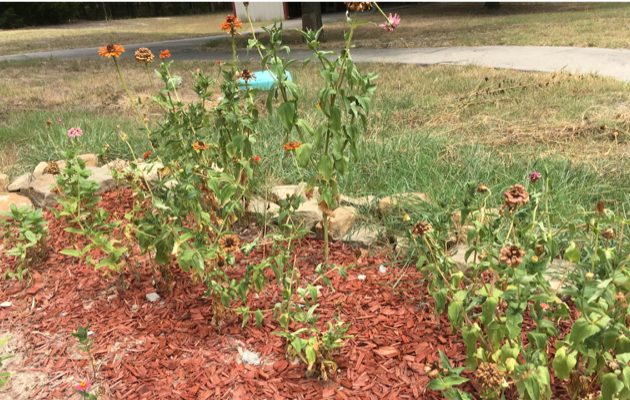 The seeds in my gardens missed their cues to shyly emerge, they scratched their little plant heads in the premature heat, turned over in their beds and went back to sleep. At least that’s what it looked like to me on the surface. “I just want to skip the summer and go straight to September,” I told Hubs, “I’m dreading the exhaustion, the lack of stamina, the ennui brought on by my weather app. and it’s temperature display ’104° feels like 109°.’” He nodded. As a bona-fide Texan he’s felt it all. The grass has been dead for weeks, none of my usual wildflowers have sprawled across the fields, anything with a petal hesitated before blooming, then turned brown and drooped likes rows of hung-men dangling from their gallows. My beds have been looking like the end of August since the beginning of June. By the middle of July I’d given up my daytime walks to head out before sunrise in the relative coolth of 85° and I know I’m an acclimatized Texan when the heat index hits 109° and a southerly breeze in my face feels cool at 95°. Our land is embraced by two creeks, one is fed from an uphill spring and the other is ephemeral, rising when the rainfall is heavy. I’ve filled up a large, rubbermaid water bowl and set it close enough to our front porch so that Hubs and I can watch some of the smaller birds fly in for a splash. The cardinals have tentatively adopted it this year and the male sits in my Vitex to keep guard, cheeping loudly while his female flies down, veers off, makes another pass, getting a little closer each time, until she nervously perches on the edge to sip the cool water while her mate keeps up his tweeting. 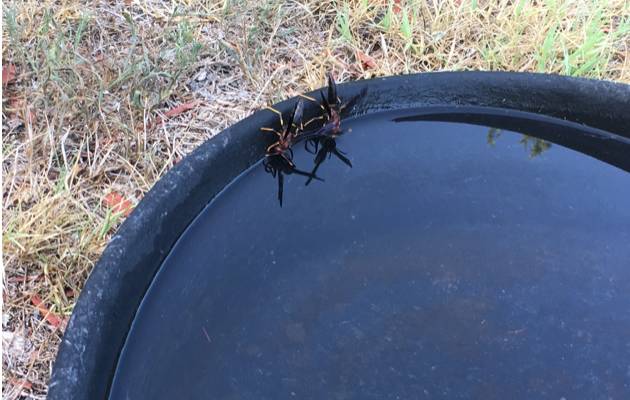 a couple of mud daubers just hanging off the side quenching their thirsts.